What Day Of The Week Is August 3? 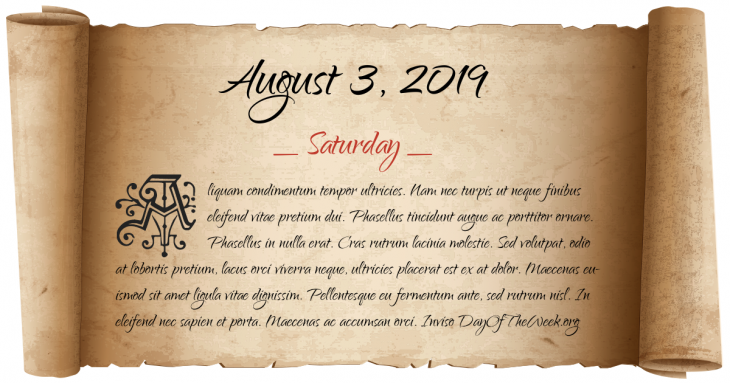 August 3, 2019 is the 215th day of the year 2019 in the Gregorian calendar. There are 150 days remaining until the end of the year. The day of the week is Saturday. Roman Empire general Tiberius defeats Dalmatae on the river Bathinus. Olaf II of Norway is canonised as Saint Olaf by Grimketel, the English Bishop of Selsey. First ascent of Jungfrau, third highest summit in the Bernese Alps by brothers Johann Rudolf and Hieronymus Meyer. Judge Kenesaw Mountain Landis fines Standard Oil of Indiana a record $29.4 million for illegal rebating to freight carriers; the conviction and fine are later reversed on appeal. Who were born on August 3?